This product is the perfect size for gathering around a kitchen island or as extra seating at the dining table, featuring a simple frame design with a dark sandblasted finish. A three inch woven cushion in a black and cream African inspired mud cloth pattern adds contrast to the sleek metal design. With an extra foot bar for enhanced comfort. Easy to assemble and maintain. When you buy a Bungalow Rose Ridgecrest 24" Bar Stool online from Wayfair, we make it as easy as possible for you to find out when your product will be delivered. Read customer reviews and common Questions and Answers for Bungalow Rose Part #: BGRS4412 on this page. If you have any questions about your purchase or any other product for sale, our customer service representatives are available to help. Whether you just want to buy a Bungalow Rose Ridgecrest 24" Bar Stool or shop for your entire home, Wayfair has a zillion things home. The simplistic assembly process was what I liked. No over thinking needed. All of the items were well protected from scratching against themselves in the box, this was a plus as well. LOVE THESE STOOLS so much. A lot more comfortable than I thought they would be. They are exactly my style Im so glad I found them! I love the mudcloth and the seat is really comfy. But there were some issues. The box was stained with oil when it arrived. Euw. The one of the crossbars doesn't quite meet the leg.The one of the plastic caps on the bottom of the leg fell off and the other was broken in half. Did not realize the legs were metal not wood. However, it looks great, was pretty easy to assemble (I'm not a fan of Allen wrenches) and in general I'm satisfied. A good deal of the enamel came chipped. Two of the three I ordered were missing the foot caps on at least one leg. Theres metal rattling around inside the frames too. The cushion looks great and is comfy but i'll still be returning this tiem. These are very cute. Easy to assemble. The foam pad is firm, and comfortable. I ordered 3. I would have given five stars but one had chipped paint toward the bottom. Perfect for my sons room. Easy to assemble. frame is metal, not wood. very easy to assemble. sturdy, and love the fabric! The Provost 24" Bar Stool is the perfect size for gathering around a kitchen island or as extra seating at the dining table, featuring a simple frame design with a dark sandblasted finish. With an extra foot bar for enhanced comfort. Easy to assemble and maintain. Rated 4 out of 5 stars.114 total votes. Behind every kitchen island or entertainment space, there’s a bar stool waiting to be sat on. Oftentimes, they’re the first spot we pick to sit down with a morning cup of coffee or a glass of wine with a friend; little ones love them, too, as a perch for enjoying breakfast, completing homework, and more. With its clean, honest design, this 24" bar stool fits right in with today’s modern homes. Its metal frame is coated in a sand-blasted black finish, and its foam-filled seat is wrapped in slubby linen weave upholstery for a cozy, tactile look. Rated 3 out of 5 stars.2 total votes. This Hofer 25" Bar Stool embodies that industrial flair to complete your counter space. With a black metal frame, upholstered seat, and backless design pulls this stool up to a bar or counter for quick meals or an after-work glass of wine. Rated 4 out of 5 stars.149 total votes. 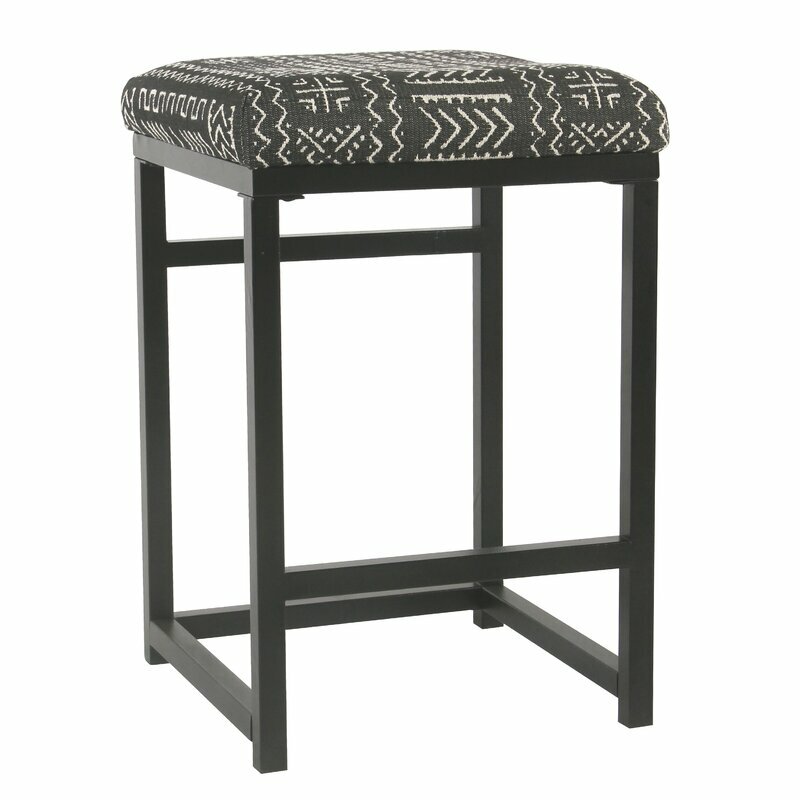 Bring simply-chic style to your pub table or kitchen island with this understated stool! Founded on a solid hardwood frame, this charming design strikes a contemporary silhouette with a backless seat and four tapered square legs with a built-in footrest. Enveloped in 100% polyester upholstery, the seat showcases detail stitched edges and brass nailhead trim for a tailored touch, while cushioned padding provides added comfort and support. This stool has a 275 lbs. weight capacity. Industrial woven stool crafted from iron material, features a woven-style seat in a finish, supported by a sturdy frame with 4 footed legs, horizontal bars and curved vertical bars, comes in a b finish. Classic with a handsome, contemporary twist, the Windham Bar Stool features a wood base and upholstered seat. Perfect for friends and family to gather around the kitchen counter on or when not in use, this backless design can be pulled under any counter for a clutter free environment. Finishing details like a nail head trim and simple wood carving on the base add a hint of sophistication and charm. This counter stool is the perfect blend of functionality and style for the home. 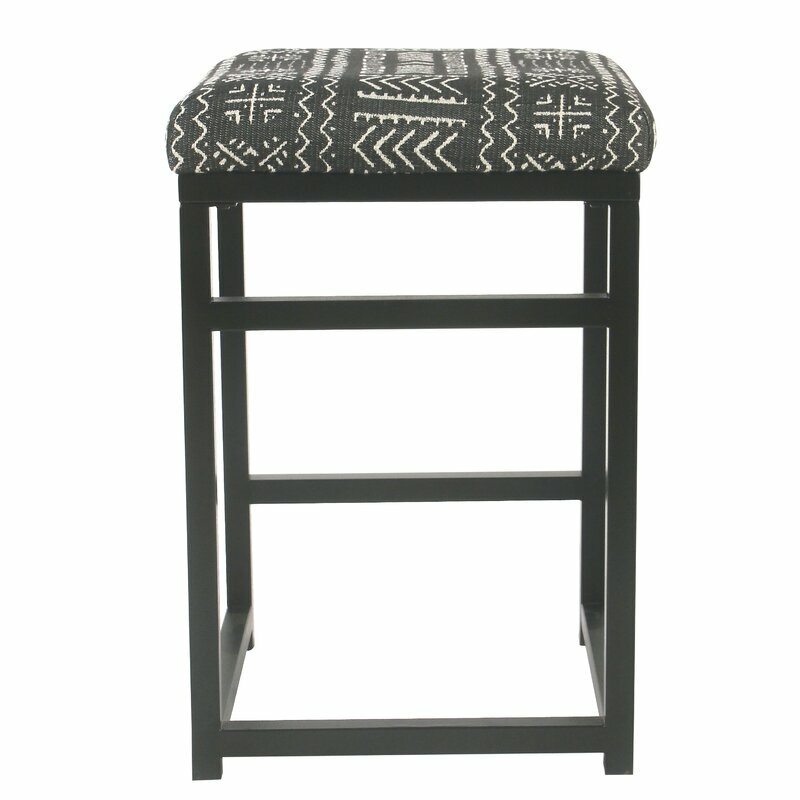 Elevate the look of your home with this chic 30" Bar Stool. The saddle design frame of this stool is constructed of sturdy metal and lends a modern industrial feel. A square upholstered top compliments the metal frame for an eclectic, transitional look. The backless design and open frame keep this bar stool keep your room feeling open and airy. Line a few of these stylish bar tools at the kitchen island to create a trendy breakfast nook or to elevate the look of your entertainment space. Rated 4 out of 5 stars.260 total votes. Rated 4 out of 5 stars.1458 total votes. Sitting at the perfect height for kitchen islands, breakfast bars, and pub tables, bar stools have a leg up on other seating options. Take this bar stool for example: perfectly suited for your home’s contemporary aesthetic. It features a curved full back, square seat, and built-in footrest. The frame of this bar stool is crafted from metal and can be stacked. It measures 34'' H x 18'' W x 17'' D. This bar stool requires some assembly upon arrival. Bring industrial style to the home bar or kitchen island with this stool. Its base is crafted from metal and features a clean-lined silhouette certain to blend in with a variety of decor schemes. A square seat crafted from wood offers a contrast as it creates a space to sit and sip cocktails or enjoy Sunday brunch, while a cross brace acts as a stabilizer and a stylish accent. Gliders protect your floor from scratches and scrapes.